Frankel Sims Law, a small, woman-owned organization, was doing well overall — the firm was growing steadily, adding clients, and building a solid reputation in their niche. However, the owner of Frankel Sims Law felt that financially speaking, something wasn’t right: namely, their profitability was not in line with how hard they were working. She felt like they should be making more money, and have better cash flow, based on the large (and growing) number of hours she and her team were logging. We also designed monthly and annual financial strategies that would allow the owner and her team to continue to monitor, and be more proactive about, her ongoing financials. 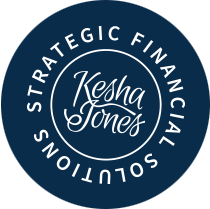 Kesha Jones Strategic Financial Solutions was able to develop a relationship with Frankel Sims Law by being part of the team — and the solution — that helped them not only learn to improve the way they work, but also to work smarter to achieve their goals. Work Life Balance…The Juggle Is Real! “As the founder of a startup, I am focused on my craft and don’t have the bandwidth or expertise to have a full grasp on my financials." “As the owner of a small business, I have to wear many hats and CFO does not come naturally to me."